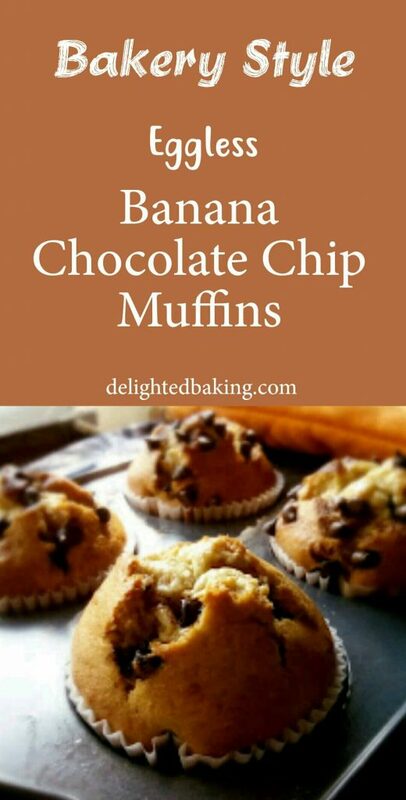 Eggless Banana Chocolate Chip Muffins – Moist, fluffy and eggless banana muffins with chocolate chips. Perfect dessert, kid’s friendly and a healthy snack. I love to make muffins and cupcakes. 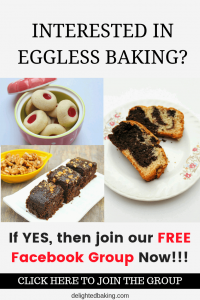 They are easy to make and eat. They need a handful of ingredients and get baked in a few minutes. They also make up for a nice gift. You can gift your relatives, friends, colleagues etc with a box full of homemade muffins. So yesterday I tried making Banana Chocolate Chip Muffins. It took me only an hour to make them. They get baked in 20-25 minutes. And the preparation time for these muffins is also very less. So it’s an easy, simple and less time-consuming recipe. Now, these muffins are a healthy snack/dessert. They are perfect for early morning breakfasts. Just eat one or two of these muffins and you are sorted. They are a perfect evening snack for kids also. And not to forget, they are so healthy. These are quick and easy banana chocolate chip muffins! For making these banana chocolate chips muffins, we will take oil and sugar in a mixing bowl. Use powdered sugar in this recipe. We will whip the oil and sugar for one to two minutes. This step is important as it helps in making the muffins soft and fluffy. Therefore do not avoid this step. We will mash/puree the bananas for muffins. You can roughly chop the bananas. Add them into a separate bowl and mash them with the help of a fork. Or you can add the diced bananas into a blender jar and puree them. Add the mashed/pureed bananas into the oil and sugar mixture. Mix well! You can also add the vanilla essence at this point. In a separate mixing bowl sieve all the dry ingredients. Add the chocolate chips into the dry ingredients and mix them so that all the chocolate chips get covered with the flour. This is done to ensure that the chocolate chips do not sink to the bottom of the muffins. Now, we will add the dry ingredients into the wet ingredients. Add will mix them using a spatula. Remember not to over mix the muffin batter. We will bake these banana chocolate chip muffins at 180C/350F for 10-12 minutes or till a toothpick inserted into the center of the muffin comes out clean. Do try this recipe. 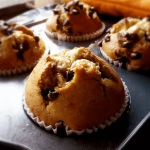 I am sure you would definitely like these delicious banana chocolate chip muffins and if you have any questions regarding the recipe then feel free to ask them in the comments below. Eggless Banana Chocolate Chips Muffins - Soft and moist banana muffins with chocolate chips. Preheat the oven to 180 C / 350 F. Line a muffin tray with paper cups. For this firstly, spread oil properly, on the muffin tray. Now put the paper cups. Let's now make our muffins. Firstly mash the bananas. The mashed bananas should measure up to one cup. Put the mashed bananas in a bowl. Add oil and sugar. NOTE - It would be better if you powder the sugar before using. The sugar will mix with the oil + mashed banana mixture easily. Mix them together till the sugar gets melt. Now add vanilla essence. Add flour, baking powder and baking soda. Mix it properly so that no lumps are formed. Now add chocolate chips and nicely fold the mixture. Fill the muffin tray with this mixture. You can fill it to the top. Add some chocolate chips on the top. Bake for 15-20 minutes at 180 C / 350 F.
Your Banana Chocolate Chip Muffins are ready!